God dammit. 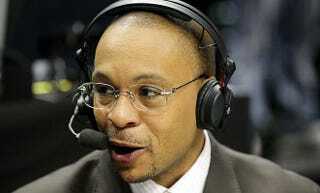 As a staunch Gus Johnson apologist, I wanted to think that he could pull off learning and announcing soccer given his mastery of basketball and football (the American kind). That has not happened. Gus Johnson is bad at calling soccer games. Johnson, the man FOX wants to call the 2018 World Cup, has not improved much since delving into the sport last year. He lacks tactical knowledge, sounds like he's reading note cards when talking about players, and often reacts too slowly during buildup play, causing him to go from a tone of voice reserved for mundane moments to Guscon 1 with no in-between. While a lot of criticism is coming in on both Gus and broadcast partner Eric Wynalda, this is not fair. Wynalda, despite his lack of a British accent, is a serviceable analyst. But with a play-by-play guy who is not up to speed, the chemistry just can't be there. One also has to wonder if Wynalda is dumbing things down for a play-by-play man who clearly does not yet have the knowledge required to call soccer games at a high level. Either way, this is not Wynalda's fault. Gus has just been bad. Here is a sampling of the feedback on Gus' performance during today's UEFA Champions League match between Bayern Munich and Real Madrid, in which Gus described Karim Benzema as a guy who can move for a big man (lol).